I “ran” in my third road race last weekend. I say “ran” because I spent more time walking than running in this one, thanks to unseasonably high temperatures and my apparent inability to tolerate them. 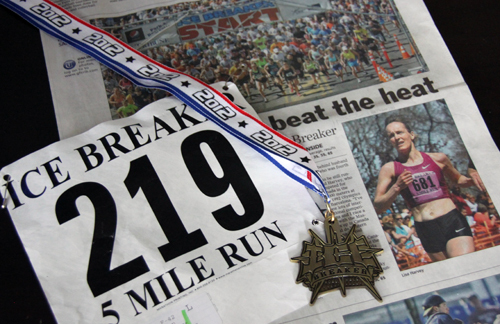 The race was the Ice Breaker Road Race held in Great Falls, Montana, which offers 1-mile, 3-mile and 5-mile options. Having done the 3-mile race one other time about 10 years ago, I was looking forward to participating again, and when registration opened up in early March, I took the leap and decided to give the 5-mile race a try. A nice challenge, I thought… only it turned out to be a bit more of a challenge than I had anticipated. Though immensely relieved to have crossed the finish line, the rest of day didn’t fare much better. I ended up battling nausea for a good part of the afternoon and evening, despite a nice lunch with the friend I attended with and a quick trip through a favorite thrift store. Even now, four days later, I’m not feeling all that great. Most likely just a coincidence, I managed to contract a nasty head cold early in the week, which has led me to skip any running workouts I might have done this week, instead just walking and resting more than usual. The whole experience has been a little disappointing… instead of the usual “high” from accomplishing a goal, at the moment I’m feeling a little defeated and not particularly motivated to get out for a run. I’m guessing this is largely a result of this dang head cold and I’m hoping I feel more enthused after it (finally) clears. In the meantime, though, I’d like to figure out a better way to deal with the heat+running combination. If I continue participating in road races, which I would like to do, I would like to have a little more control of the situation and a better chance of a positive outcome. If you can relate or have suggestions for me, I’d love to hear them!